What cleaning supplies to you carry in your trunk to clean the car during your travels? Window cleaner, spray car wash/wax, and a couple of microfiber towels. I'm heading out of town in a few hrs for my 40th class reunion. My cleaning tub contains: bug & tar remover, window cleaner, Adam's detailer, 3 microfiber towels. Quick wax, a water bottle, and a few microfiber towels. I use the quick wax as a drying aid/lubricant when I need to wipe something off the paint. If I was traveling, I would take Invisible Glass, and maybe some wax and a few buffing towels. husker, if you are using a heavy duty cleaner for tar while traveling, be aware that most tar removers will strip wax off the paint, which will leave you without any protection. Both the frunk and trunk get quite warm on long trips. So any containers with liquids can get hot, causing the contents to expand and leak out of their containers. I once drove from New Jersey down to North Carolina with 2 bottles of wine in the frunk along with my luggage. The wine bottles got so warm that the wine pushed out around the side of the corks, which surprisingly to me did not move out of the bottles at all. Luckily the wine bottles were in plastic bags which contained the leaks. We can't store anything perishable in our Boot/Bonnets due to the extreme heat. Does anyone use waterless washes? Do they differ much from a spray wax? Can't bring myself to try either yet. I just bought some Optimum No Rinse to try out. I think the main difference versus a spray wax, is that the ONR claims to encapsulate dirt instead of just lubricating it. Last edited by JayG; 07-10-2017 at 07:07 AM. RO water, screen clean, Opaque wax, microfibres. 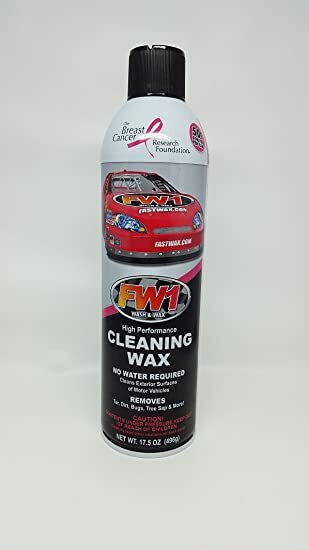 You can never go wrong with a bottle of this stuff along with some towels..
For me, in normal use I just keep a bottle of Griots Garage spray detailer (either Speed Shine or their new Best in Show product that adds a little wax to the detailer), and a good, clean microfiber. For longer trips, I add Invisible Glass, Griot's Spray-on Wash, and Griot's Heavy Duty Wheel Cleaner to deal with brake dust. Of course, separate clean micro fibers for each, and you need a special soft, deep nap towel for any waterless wash. I like Griot's, but others work well too. Also, agree on ArmorAll. Stopped using that stuff many, many years ago. I correlated it with cracked dashboards. A California Duster makes short work of light dirt and rubber behind the rear tires. I've got a small padded bag that contains a miniature spray bottle of window cleaner, a miniature bottle of my favorite spray detailer (Mother's Showtime), and, because I read (probably on this board) that it's the best way to remove bird poop, a tiny bottle of hand sanitizer. Plus some microfiber towels, and just the top of a rug cleaner bottle, because it's a sponge surrounded by a brush. Great for brushing/wiping bird poop off the fabric top. In the center console I've got a small natural brush (almost like a shaving brush) for getting crud out of the dash seams, an old toothbrush for removing wax from the creases in the car body, and a Swiffer sheet for wiping up pollen and dust from the dash. I just realized that I have OCD. I just have some water repellant window cleaner and a few micro fiber towels. There's usually a DIY car wash close to where I am, so a quick wash can be done quite easily. If not, I'll just wash it when I get home. Is there a wheel cleaner that doesn't need to be rinsed? An interesting question. I am not aware of a "magic" wheel cleaner that will make brake dust, road grime, and tar stream or fly right off a wheel. You wouldn't want it to fly off, in any event, because it would likely end up all over the sides of your car when you drive it. I suppose that if I was unable to rinse off my wheels, what I would do would be to spray 2 parts Simple Green diluted with 1 part water on the wheels and wipe the filth off with a towel. Without rinsing, you wouldn't be able to get all the Simple Green off, but Simple Green is so innocuous that I do not believe it would harm the clear-coat on the wheels. Being something of a Made in Germany snob, I usually use Sonax Wheel Cleaner Plus on my BBS Made in Germany wheels, but I have also used this 2:1 Simple Green dilution, and there is very little difference in cleaning power! My Duster, Microfiber towels, My formula of window cleaner, Mothers Spray Wax. Spray bottle of Distilled Water, Tire Dressing. Last edited by Lew; 07-12-2017 at 06:51 PM.